SAN FRANCISCO—The California Supreme Court today announced the appointment of Justice Marla J. Miller to fill a vacancy on the Supreme Court Committee on Judicial Ethics Opinions (CJEO), an independent committee that helps inform the judiciary and the public on judicial ethics topics. Justice Miller, of the First District Court of Appeal, Division Two (San Francisco), was appointed for the balance of the term to be vacated by Justice Maria P. Rivera, who announced her resignation from CJEO effective December 31. Justice Rivera, a founding member of CJEO who served for seven years, also announced her retirement as an Associate Justice of the First District Court of Appeal, Division Four. Justice Miller’s CJEO appointment is effective January 1, 2018, through December 31, 2018. 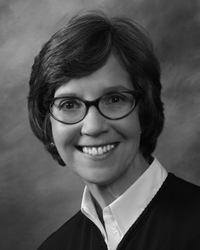 Justice Miller has served on the appellate bench since 2014. Before joining the First District Court of Appeal, she served for more than nine years as a judge on the San Francisco Superior Court in both criminal and civil assignments, including the law and motion department. Justice Miller’s pre-bench experience includes specializing in complex civil litigation as a partner at Morrison & Foerster and serving as chair of the litigation department while a director at Howard, Rice, Nemerovski, Canady, Robertson & Falk. She also served as an Assistant United States Attorney in the criminal division of the U.S. Attorney’s Office for the Northern District of California, as well as Chief Assistant District Attorney in the San Francisco District Attorney’s Office. Her extensive committee work includes currently serving on the Judicial Council Advisory Committee on Civil Jury Instructions, and prior service on the Judicial Council Access and Fairness Advisory Committee, the Bar Association of San Francisco Board of Directors, and the State Bar of California Committee on Women in the Law. Justice Miller teaches evidence in civil and criminal cases to trial court judges at the California Center for Judicial Education and Research, and has taught jury trial management at the B. E. Witkin Judicial College of California. Information on CJEO members can be found at http://www.judicialethicsopinions.ca.gov/members/.